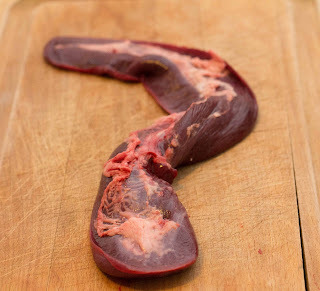 When I saw a pig’s spleen in person for the first time, all I could think of was, “That looks like a giant purple leech.” It was at Mosefund Farm’s Pigstock and we we’re sorting out the organs from the evisceration. The spleen looked strange, alien, and something that would taste very strong and require some precise cooking technique to cook. Thankfully, I was totally wrong. Some writers categorize offal into two groups; white and red. "White" would be the sweetbreads, brains, tripe, testicles, and feet. "Red" would be the liver, heart, tongue, spleen, kidneys and (of course) blood. Of all of the red offal, spleen is probably the mildest. Spleens are long, flat, and have a thin membrane surrounding them. A small amount of fat and connective tissue is on the back side. Biologically, spleens are used to filter blood, remove iron from blood, produce antibodies, and hold a reservoir of blood in case of major hemorrhaging. Meteorologically, spleens are used by farmers to predict weather six months down the line. Really. You can even buy a t-shirt. Unfortunately, spleens are small (often a pound or less) and oft-neglected, so they're often thrown out at the abattoir. So when I saw one from Northwoods Ranch, I snapped it up. I knew just how I wanted to cook it; on toast. Sure, the initial photos of a spleen look pretty intimidating, but how hard can anything be that you spread on toast? 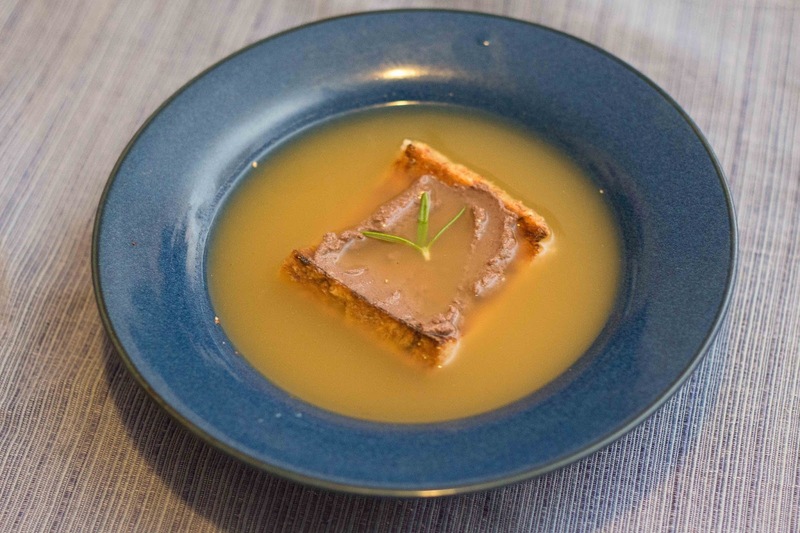 This was actually a recipe served to us at Pigstock, made by Christoph Wiesner’s wife, Isabell. Just poach the spleen in stock, scratch the soft spleen from the outer membrane, season with cream, white pepper, salt, and nutmeg. Serve on toast. I copped her idea and floated the toast on some reserved broth, which made this humble dish look very deluxe. But that’s it - dead simple. The spleen is mild, savory, and doesn't carry the strong iron flavor you’d find in liver. And it’s really hard to mess up. Trust me, I did. I cut through part of the membrane too much and completely severed off an end of the spleen. But with a firm membrane and soft center, I realized I could just rub the loose bit of spleen in a mesh strainer to sieve the edible spleen from the tough membrane. You could actually do the entire spleen that way, if you wanted. Although if you’re cooking marble-sized chicken spleens, you don’t really need to take off the membrane. I just eat them whole, like the liver or heart. My Mother used to serve us ground spleen on toast when I was little. The recipe that came from her Great Aunt in Austria. It is simple to make and addicting, especially when I run a little anemic. Pork spleen is best but calf spleen is also good, and if beef is similar if not too old an animal. Just clean the veins and fat from the underside and cut in sections to make it easier to grind in food processor. No need to remove the membrane. Then I put about 3/8" thick spread on a buttered slice of bread and salt well. Bake at 350 for about 12 mins. until cooked through to your preference. I prefer medium to medium rare and put a little butter on top to melt. The ground mixture can be frozen or stored in fridge for a few days. Enjoy! Thanks so much for the comment and recipe! That sounds like a great savory snack for a cold afternoon. I will definitely give that a try!